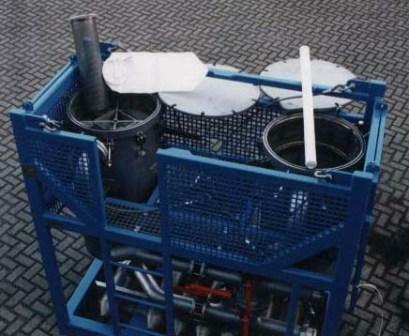 The Duplex Bag Filter Unit is the most commonly used bag filter unit in the oilfield industry. This offshore proof, skid-mounted filter unit is equipped with all necessary valves and safety features. The unit offers the most cost effective way to clean-up all possible oilfield fluids. It allows you to simultaneously filter with one vessel, and easily change out the used bags of the other vessel. Standard TDW 610 type 4 bags per vessel. Robust offshore frame according DNV 2.7.1.